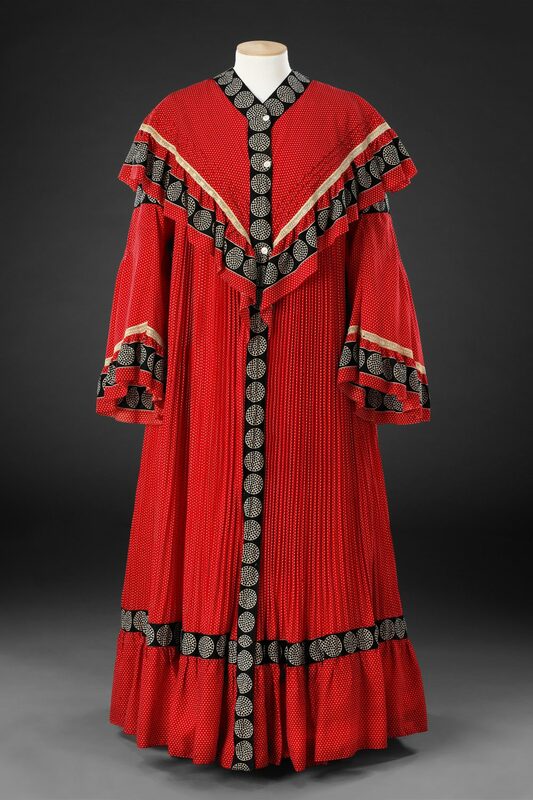 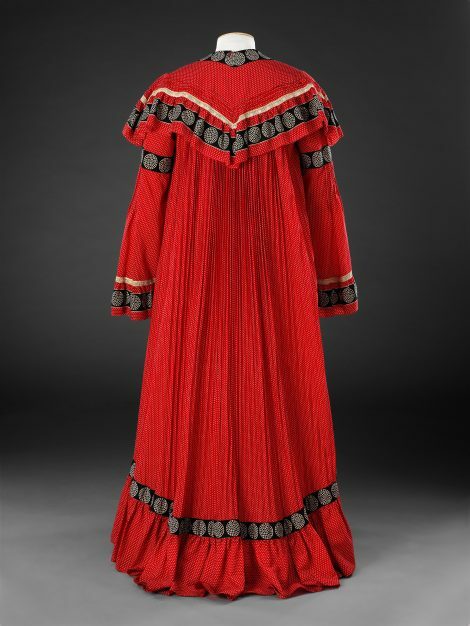 This striking dressing or morning gown belonged to a family member of the Cadbury family who were eminent Quakers and chocolate manufacturers in Birmingham. 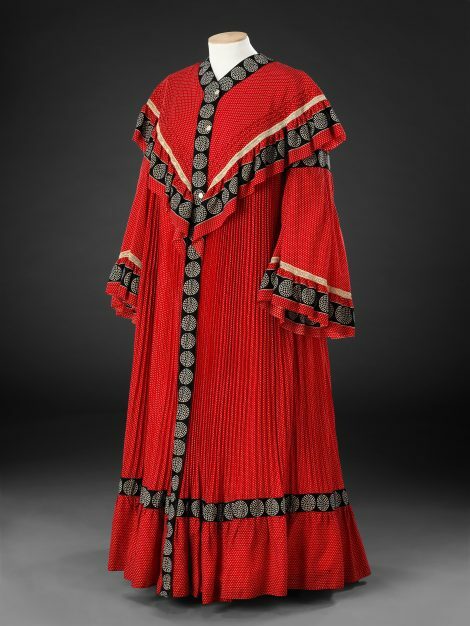 Made of fine wool printed with white pin spots on a scarlet ground it is bordered with broad black bands printed with black-spotted white roundels to complement the ground fabric. The knife pleated skirt falls from a straight yoke beneath the large collar that, like the long flared sleeves, is trimmed with a deep flounce, tucks and narrow machine embroidered braid. 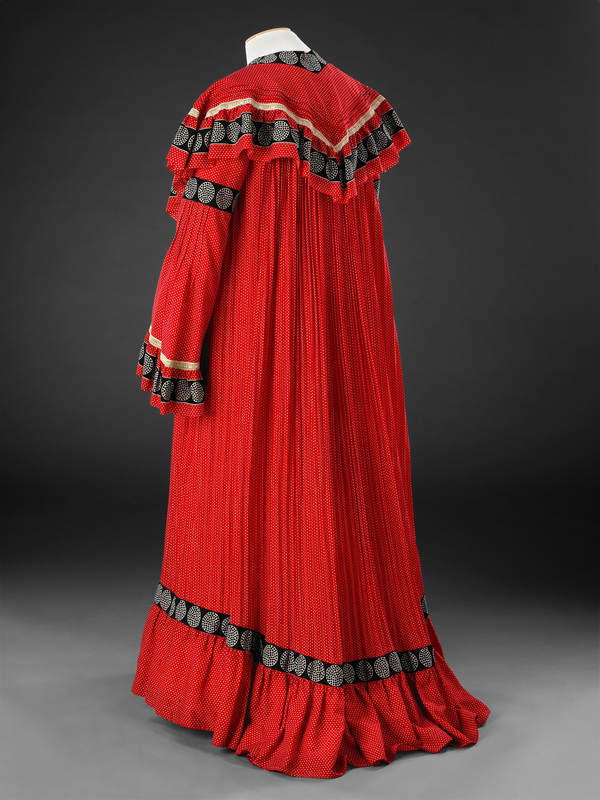 Judging from the length of the garment, it was worn by a tall woman; nevertheless a deep internal tuck has been hand stitched above the hem flounce to shorten it, suggesting that the gown was originally intended to sweep the ground gracefully, if impractically. 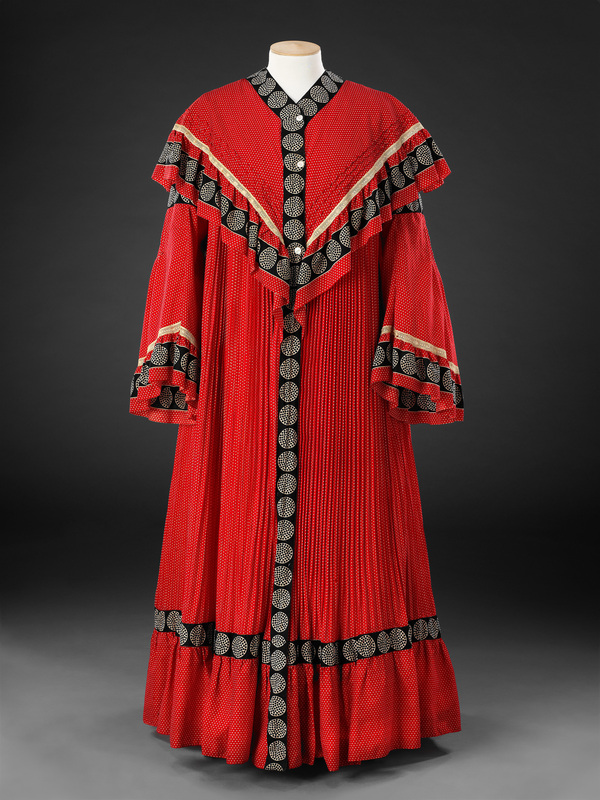 Although this example has been made commercially, the loose unstructured form of dressing gowns made them ideal projects for home dressmakers who might struggle with more fitted garments like dresses, and who would enjoy choosing appropriate fabrics and trimmings. 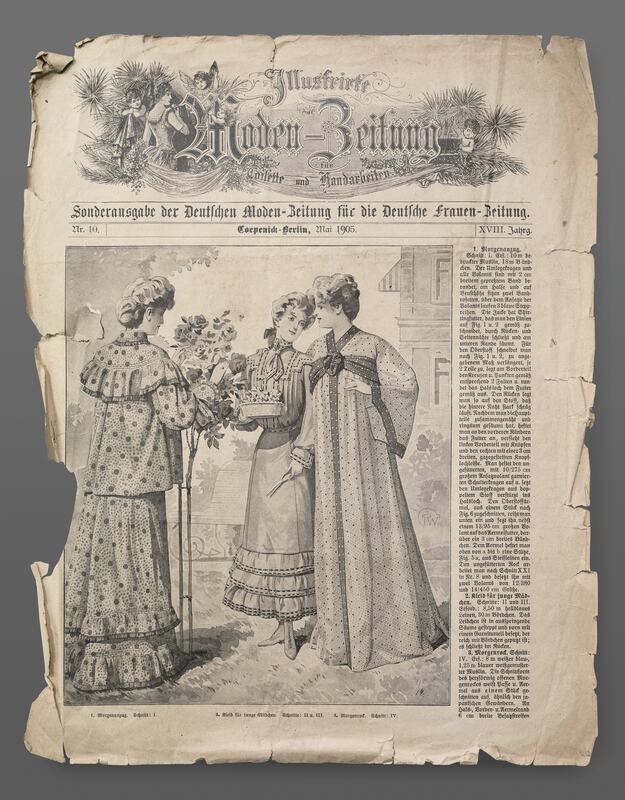 ‘Additional Images’ shows the cover of a monthly pattern supplement to the German magazine Deutsche Frauen Zeitung of May 1905 illustrating informal wear very similar in concept to our gown. 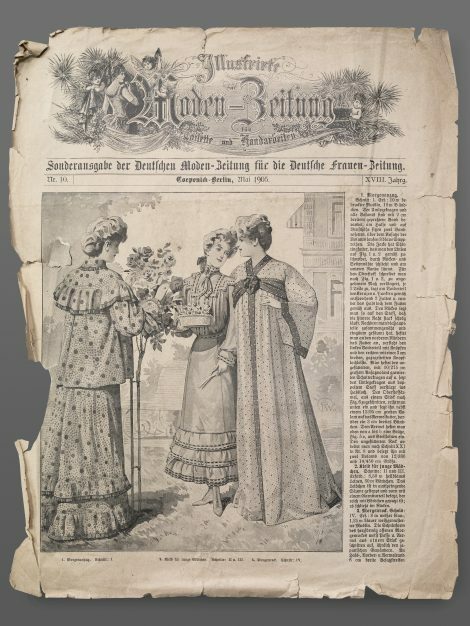 On the right a morning gown of spotted fabric with dark contrasting borders required 8 metres of white, blue-patterned muslin for the main garment with 1,25 metres of blue, white patterned muslin for the 3 cm wide borders. The two piece morning outfit on the left with deep flounced caped collar, loose sleeves and hem needed 10 metres of muslin, shown here printed with spots in two sizes.